Cask Strength: Panacea or Gimmick? After trying both Bunnahabhain 12 Year and Ledaig 10 Year, I was very curious to see how they would work together. Bunnahabhain has rich sherry and some maritime influence, while Ledaig is robustly peaty with strong bourbon barrel notes. That sounded like an attractive combination. Nose: Rich, earthy peat undergirded by dry sherry and malt, a bit farmy and meaty, slightly floral, cacao nibs, salty/maritime, seaweed. After adding a few drops of water, it becomes maltier with less aggressive (and more integrated) peat and very little sherry, big salted caramels come out, barely perceptible oak, a bit of vanilla. Taste: mildly sweet and salty malt/bourbon barrel notes up front, earthy peat and dank sherry come in behind, then a slightly sharp oak note comes in near the back, with some new make vegetal notes drifting throughout. After dilution, there are strong salted caramel notes up front, flowing into more vegetal peat notes, less oak, sherry undertones (more with time), and floral overtones. While this is pretty good and almost what I was aiming for, I'm hampered by only having access to the finished, blended products, rather than a warehouse full of single casks to work with. To begin with, it'd be great to amp up the sherried Bunnahabhain component. It'd also be nice to have some older Ledaig to work with, to give the peat more dimensions. Ultimately I'd be really happy if Burn Stewart decided to put out some blended malts alongside Black Bottle, their bread & butter blended whisky. The common island character of their malts from Bunnahabhain and Tobermory give them a core to build around, while each could bring its own unique flavors to a blended malt. The closest thing on the market right now is actually Bunnahabhain's Toiteach, which combines younger peated whisky with older sherry casks. But Bunnahabhain and Ledaig's peat have different characteristics, so it'd be fascinating to see how they played together. This is definitely a concept I'll be continuing to pursue, because I think the results could be very, very tasty. While Bunnahabhain is mostly known for its unpeated whiskies, they did an experimental run with 38 PPM peated malt in 1997. A number of independent bottlers got ahead of whisky from that run and have since been bottling it in dribs and drabs over the last few years. I've tried a wine cask-finished expression from Murray McDavid before, so I was really looking forward to trying more. This particular bottle comes from Signatory's Cask Strength collection and was aged in an ex-bourbon hogshead for 13 years. Many thanks to Dave Worthington of Whisky Discovery for a sample. Nose: rather closed, hints of malt and dry peat smoke, a touch of oak, very light fruit/floral/vanilla, cinnamon, a little green and vegetal. After adding a few drops of water, it opens up quite a bit to give much richer malt, toasted grain, less peat, more integrated wood, and nutty vanilla sugar cookies, and some industrial oiliness like gasoline or diesel. Taste: thick and rich cask strength sweetness, very malty, citrus, a hefty dose of oak, dry peat smoke, bourbon barrel caramel, and a bit of vanilla, a touch of sourness throughout. After dilution, it's sweeter and has a thicker body with more clear bourbon barrel influence, peat and salt wait until the very end to pop out, almond cookies mid-palate, there's a touch of anise at the back, a little rubbery, and some fruit compote riding through. This reminds me an awful lot of Laphroaig Cask Strength. There's the same thick sweetness followed by bone dry peat smoke. In fact, if you enjoy Laphroaig, I can fairly confidently say that you would enjoy a bottle of 1997 peated Bunnahabhain. Alternatively, give Bunnahabhain's new Toiteach a try, which is a mix of younger peated whisky and older sherry casks. Zooming out, I can also see how this whisky would be great blend fodder. The smoke counterpoints well with the sweet malt and would play nice with grain whisky to add some more sweet vanilla to the mix, especially if you can toss in some sherry cask malts as well. 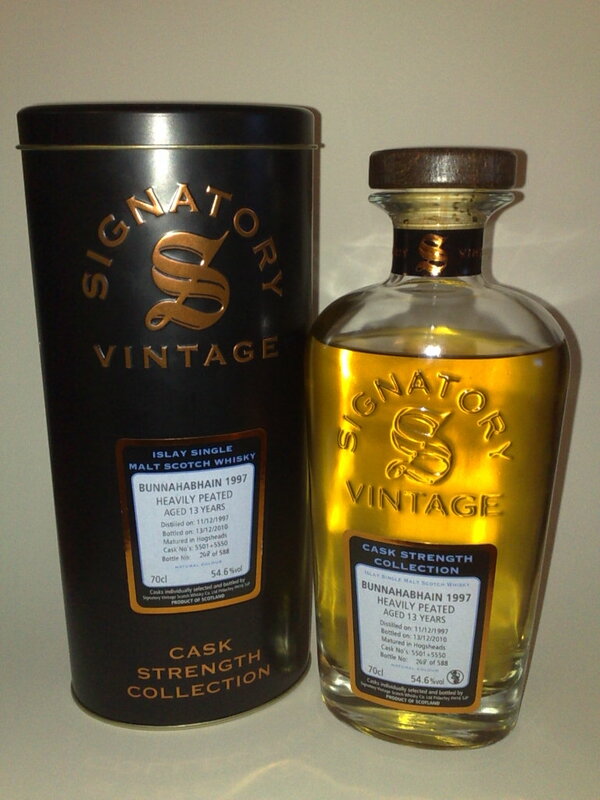 While I don't have this particular bottle, I do have another 1997 peated Bunnahabhain from Signatory that I'm looking forward to both drinking by itself and using to make my own blends. After my tour of the distillery, I trooped down to one of Lagavulin's dunnage warehouses for the Warehouse Demonstration at 10:30 AM (thankfully my Scottish breakfast was still holding strong). This is a tasting of whiskies of various ages straight from the casks led by Iain McArthur, who has been a Lagavulin employee for 40 years and is now the warehouse manager. Instead of burying the lede, I'll just say up front that this was hands down the best tasting I did during my entire trip. If you're going to be on Islay and like peated whisky, this is the one tasting that I would say is a must. It's well done, the whisky is incredible, and the price is an absolute steal at £15. Lagavulin keeps about 7,000 casks on site and another 6,000 casks in the bonded warehouses at the old Port Ellen distillery. 95% of what they make is destined for single malts and all of it is aged on Islay, unlike its sister distillery Caol Ila, where most of the spirit is taken to the mainland by tanker truck. Iain also mentioned that Lagavulin will regularly use a single cask for up to 100 years over the course of multiple fillings. While the portions were extremely generous 40-50 mL pours (I actually had to dump a decent number out instead of finishing them), notes are somewhat abbreviated as I was trying to keep up with the progress of the demonstration. I was, to put it mildly, surprised by how good the new make tasted. Given the setup of Lagavulin's stills, I expected something of a hot mess, with off notes from the heads and tails clashing with the malt core. Instead, it was almost refined and actually quite drinkable. The apple notes were my favorite part, as they were a nice counterpoint to the fresh peat. I genuinely wish Lagavulin would bottle and sell this stuff - I would buy it in a heartbeat. This was, as Iain put it, 'baby Lagavulin'. The sherry casks had added their traditional layer to the spirit, but it lacked the refinement and nuance of older whisky. Taste: very sweet, bourbon barrel influence is clear, more integrated peat, apple. After adding water, it was less sweet with more oak, chocolate in the middle, more fruity and stronger barrel influence. This was the essence of a good bourbon barrel peated whisky. The sweet caramel and vanilla were a perfect balance to the rashers of salty bacon and peat. It wasn't subtle, but it was incredibly tasty. I would love to be able to buy a bottle of this. Nose: more noticeable sherry, ethereal, apples/new make, malty, rose. After adding water, it was more vegetal with stronger new make notes, but salty bacon popped out. Taste: light but present sherry, lots of apples, light integrated peat, cacao, malty. After adding water, it was more malty, with stronger chocolate and green notes. This was Lagavulin starting to hit its stride. The sherry was much more integrated than in the 9 year old, with some more nuanced flavors starting to come out. The rose notes in the nose were particularly fun and the taste was becoming decadent with the sherry turning into chocolate. This was a nice, but after the rest of the line-up, less exciting dram. If you like the standard Lagavulin releases, you're almost guaranteed to like this one. So while I enjoyed it, I didn't feel sufficiently attached to it to buy a bottle from the visitor center, both because of the price and (more importantly) because I didn't want to carry around a whole bottle for the rest of my trip. I do wish they had sold a few cask samples as well - I would have snapped up a 200 or 375 mL bottle of any one of the casks I sampled that day. And given the across-the-board quality, I probably would have bought a sample from a cask that hand't been in the line-up. It's difficult to put into words just how good this whisky was. While it didn't have the traditional Lagavulin sherry, everything else about it perfectly encapsulated the distillery. The cask and spirit were in exquisite balance and most shockingly of all, the huge apple notes from the new make spirit were back, providing a burst of freshness in a rather old whisky. This was easily the whisky highlight of my trip. It blows my mind that the distillery is willing to serve us this alongside all of the other casks for a pretty minimal outlay considering the prices of older Lagavulin releases these days. I consider myself very fortunate to have sampled it, even if it will be nothing more than a memory. After the demonstration wrapped up, I very carefully got back on my bike for the ride to Ardbeg. I was, to put it mildly, pretty lit from half a dozen cask strength drams, so I was very, very thankful to be riding. If you're getting around by car, it is an absolute necessity to have someone else behind the wheel. It would take hours at minimum to sober up from a tasting of this magnitude. For another perspective on this tasting only a few days apart from mine, check out the The Pyromaniacs. This was a sample that I got from Michael Kravitz's "The Eagle Morning" project. 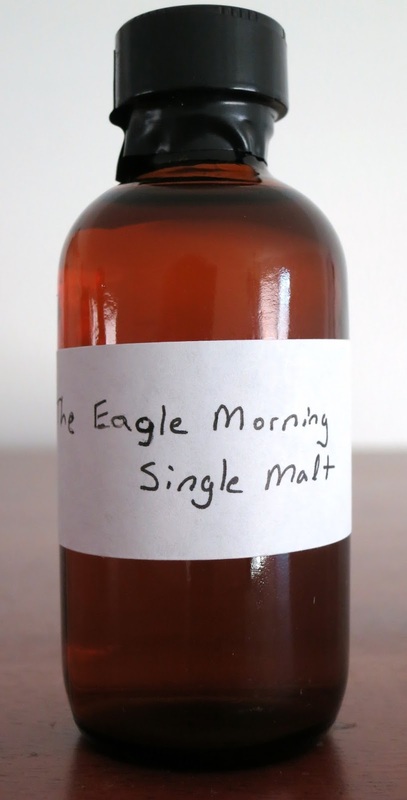 Check out his blog for the whole story, but the basic outline is that he originally filled a small cask with new make rye spirit and let it age for a number of months. After taking out the rye spirit, he refilled it with single malt whisky to make a rye-finished single malt. This is the result. Nose: solvents hit first but fade with time, young rye grain, sweet malt, vanilla, very floral, ripe and unripe fruits, very little wood, citrus, bubblegum. After adding a few drops of water, the young rye grain completely dominates. Taste: lightly sweet malt up front, young rye grain and chocolate sauce build towards the back, vanilla throughout, grainy rather than woody bitterness at the back. After dilution, the palate is similarly dominated by the young rye grain notes. While probably not to everyone's taste, I actually like this one a lot. Neat, the single malt and young rye characters are in pretty good balance. I especially like how floral the nose becomes. However, water was its Achilles heel - almost all depth and nuance was lost to the rye after adding even a little bit of water. So if you ever get to sample this one, I would recommend leaving it be. Because I didn't feel up to a second tasting after the first I did at the distillery, I came back the next morning for another round. This time I picked the cask strength flight, which has some of the distillery's top-end expressions. Nose: creamy malt, ethereal fruit/berries, toasted oak, caramel, bubblegum, fresh soap, violets/floral, a bit of wood smoke/char, light mint/vegetation. After adding a few drops of water, more bubblegum/cotton candy came out, creamy oats/malt, and a hint of orange, floral fruit (almost like sherry), and more toasted oak. Taste: piercing sweetness up front - fading gently towards the back, burnt sugar, ethereal strawberry/raspberry, light bourbon barrel notes (vanilla, caramel, oak) at the back, light orange throughout. After dilution, rich caramel sweetness throughout, orange notes tuck inside the caramel, light oak (barely bitter at all), very creamy, honey. This one was definitely a sweetie. Which actually didn't work for me too well because there wasn't enough else going on to provide balance. However, I know tastes differ, so if you like them sweet this might be a good pick. However, I'm not sure it's worth the premium over the standard Bourbon Single Cask, which, while younger, often aren't all that much less complex. Nose: strong coconut, vanilla, underlying caramel, light toasted oak, strawberry. After adding a few drops of water, the coconut becomes more toasted and syncs up with the oak, nutty, rich caramel, malty. Taste: piercing sucrose/caramel sweetness, fades into toasted oak and cacao, orange throughout. After dilution, the sucrose gives way to the caramel, coconut comes out in the middle, something vegetal at the back alongside a mix of baking spices and pepper. This is an ex-bourbon cask selected by Campbell Laing, the distillery's senior tour guide and former Glasgow policeman. While it shares many similarities with the Premium Bourbon Cask, I would pick this one over it. The coconut is a really nice addition and the palate seemed more balanced, especially with water. Sadly it is already sold out, but you might still be able to give it a try at the distillery. If not, there is a new staff pick from Kate Hartley, the distillery cafe's manager. Nose: sherried but not aggressively so, strong strawberry notes, cotton candy, lightly floral, malty, burnt sugar. After adding a few drops of water, it becomes darker and less noticeably sherried, with stewed fruits entwined with malt and chocolate, plus more oak and some fresh plum. Taste: creamy sweetness under a light layer of sherry, fading into bittersweet malt. After dilution, it became creamier with more integrated sherry, light fruit/berry notes, a little vegetation at the back, bubblegum/cotton candy throughout, and some pepper and baking spices at the back alongside the oak. Once again, this was a big sweetie, though in this case water actually helped to reign that in. I really enjoyed the nose, but felt like the palate didn't quite live up to its promise. Also, I can't say that it's a sufficient improvement over the younger Sherry Single Cask I tried to make me want to pony up the extra cash (especially since the Sherry Single Casks have been dead cheap around here). With that said, I would happily take this one over the Premium Bourbon Cask - the sherry adds complexity that the bourbon couldn't bring. Nose: baked bread, very mild peat notes (just an accent), bourbon barrel (vanilla, caramel, oak), fresh malt, a little vegetal. After adding a few drops of water, it became more malt-focused with a hint of sherry, the peat integrated and retreated, it became more vegetal with stronger oak, and some sweet berries came out. Taste: sweet malt entwined with a thread of peat smoke over a thin layer of sherry, medium oak and malt growing towards the back. After dilution, it becomes sweet and moderately oaky throughout, with more noticeable sherry, the peat lurks at the back, and it becomes peppery from the mid-palate to the end. While I liked the concept of the Devil's Punchbowl - a combination of older bourbon and sherry casks with younger peated whisky - the quality of Arran's peat keeps rubbing me the wrong way. I'd love a blended malt with Arran's unpeated whisky combined with something smoky, but I think I'd have to try making it at home to find something that will click with me. This one has gotten rave reviews, so clearly some people love it, but I would definitely file it under 'try before you by', especially at the price point. One of the biggest trends in the American whiskey world over the last few years has been sourced whiskies. And by far the biggest supplier of sourced whiskies has been MGP (previously known as LDI), the Indiana-based former Seagram's plant that was quietly churning out whiskey on contract for many years before it was discovered to be the last remaining source of aged bulk whiskey for sale in America. Most importantly, they produced whiskey with a unique 95% rye mash bill, originally designed for flavoring blended whiskeys, that could fill some of the unmet demand for rye whiskey. Despite the name, Kentucky Bourbon Distillers did not have an operating still from 1984 until 2012, so all of the whiskey they have released over the last few decades has been sourced from elsewhere. While much of it has been from the closely located Heaven Hill Distillery, they have also sourced bourbon and rye whiskey from MGP. KBD puts out single barrel whiskeys from various distilleries under the Willett label. The ryes are mostly from MGP, which can be determined by looking for the phrase 'Distilled in Indiana' on the back label. All are relatively young, ranging from three to six years old, and bottled at 55% ABV. This one is from Indiana and was bottled at 5 years old. Also, be sure to check out Michael Kravitz's review of the same whisky. I'll also be reviewing a sample I got from his bottle soon. Nose: alcohol is a noticeable overtone, fresh oak is dominant, sweet grain, pine, berries, caramel/burnt sugar, cinnamon. After adding a few drops of water, some hints of chocolate come out, the pine leans towards a more generically vegetal note, but doesn't change all that much. Taste: briefly dry/creamy grain, then thick, sweet wood, pepper/alcohol heat, cinnamon, berries, and even more oak. After dilution, the mouthfeel becomes thicker and it's sweeter overall, with slightly less assertive wood, but possibly even more aggressive alcoholic heat. Honestly, this isn't a particularly complex whiskey. It's dominated by the barrel, though the young rye pine is also pretty noticeable, leading me to initially describe it as 'a Pacific Northwest lumber yard'. The alcoholic heat is also fairly strong at full strength, which I think covers up a lot of the nuances in the spirit. This means it's also probably good to have a glass of water on hand. That's not to knock this whiskey, since I find it enjoyable, but it is what it is - relatively young rye. Because I've been curious for some time about how high proof spirits change with dilution, I watered samples down to 50% and 45% ABV and let them integrate for a number of weeks. The results were fairly striking. As you can tell from the tasting notes, I didn't like the whiskey very much at this strength. It didn't seem to have much going for it - the flavors weren't intense enough to work with the simplicity, but it wasn't mellow enough to be pleasant. Not recommended. If the whiskey is mostly about the barrel at full strength, at 45% it's all about the spirit. The high rye recipe is fully in evidence, with lots of pine and herbal notes. I'm not sure that I necessarily like this strength better, but it does have a lot more going on. I think this is part of why MGP's ryes do so well in cocktails - with water a lot of complexity comes out that plays well with other ingredients. It's unlikely that you'll find a bottle from this particular barrel - it was given to me as a Christmas present a couple of years ago. But I'm going to hazard a guess that most of them are going to be pretty similar. There's only so much you can do with 95% rye distillate in a handful of years. Would I recommend buying a bottle? Maybe. If you already like Bulleit or Templeton rye (which are sourced from the same distillery), I'd say that this is worth your while if it's not too much more than $30. At that point the extra alcohol should pay for itself. Much more (it's over $45 here in Oregon) and I'd give it a pass. There are other rye whiskeys on the market with more refinement (Sazerac 6 Year) and better price (Rittenhouse BiB) that I would grab first. But Willett is, to put it mildly, an experience. 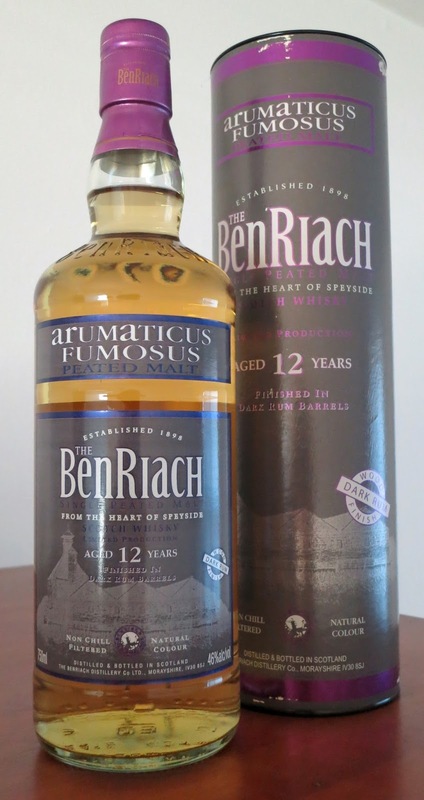 As I mentioned in my review of BenRiach Curiositas, the distillery had a significant stock of aging peated malt whisky when it was taken over by Billy Walker. One of the strategies they have taken to utilize this stock is cask finishing - transferring the spirit from ex-bourbon barrels to other more esoteric casks for some period of time to add another layer of flavor. This particular whisky is finished in Jamaican rum barrels. This is an interesting pick, as Jamaican rum usually has a very high ester content, which gives it a very unique 'dunder funk'. I've always felt that Jamaican rum was the peated whisky of the rum world, so it's interesting to see these two strongly flavored spirits brought together. As with the rest of the line, this whisky is bottled at 46% without coloring or chill filtration. Nose: lots of sweet malt wrapped in vegetal peat and grass, rummy notes - especially esters, nutmeg, and banana, very light oak, a bit salty. After adding a few drops of water, the rum tucks inside the malt whisky notes of rubbery/vegetal peat and malt, starting dry but becoming sweeter over time. Taste: sweet rum and malt up front, quickly giving way to vegetal peat, rum esters, and pepper, slowly fading back towards bittersweet malt and oak. After dilution, the rum shows up primarily as molasses and chocolate sweetness, without the aggressive esters of the neat palate, while the peat becomes significantly more subdued. Finish: peat reek, barrel char, fried bananas, molasses, rum esters, bitter oak, salty malt. If you've never tried Jamaican rum before, this is going to seem like a very odd whisky. While the rum casks do add a certain amount of sweetness, it's largely balanced by the dunder funk esters, which meld with the peat in a unique fashion. If Jamaican rum is new to you, I would highly suggest trying some Appleton V/X or, even better, Smith & Cross. Both of those rums will give you a sense of the drier, high-ester style of rum, in comparison to the sweeter molasses-driven rums that one encounters more frequently. On the plus side, this is a cask finish that hasn't erased the essential qualities of the whisky. While the rum is very present, there is still a lot of malt and peat, so it remains firmly rooted in the malt whisky world. I've grown more and more dubious about cask finishes, but this one hits the ball out of the park. The whisky and rum fit together so well - though I suspect the extra couple of years in casks helped since the peat is a bit tamer than the 10 year old Curiositas, which gives the rum a bit more room to shine. I'm curious to try the unpeated BenRiach rum finish to see how well it holds up - however, the peat seemed like a really great compliment to the rum's esters, so I'm not sure a cleaner canvas will work properly. Either way, I would highly suggest picking this one up if a) you enjoy heavily peated whiskies and b) you can still find it. Shouldn't be difficult if you live in the UK, but it might be trickier on this side of the Atlantic. But it looks like Toast Wines still has it in stock for a pretty reasonable $53 and will ship to most states. 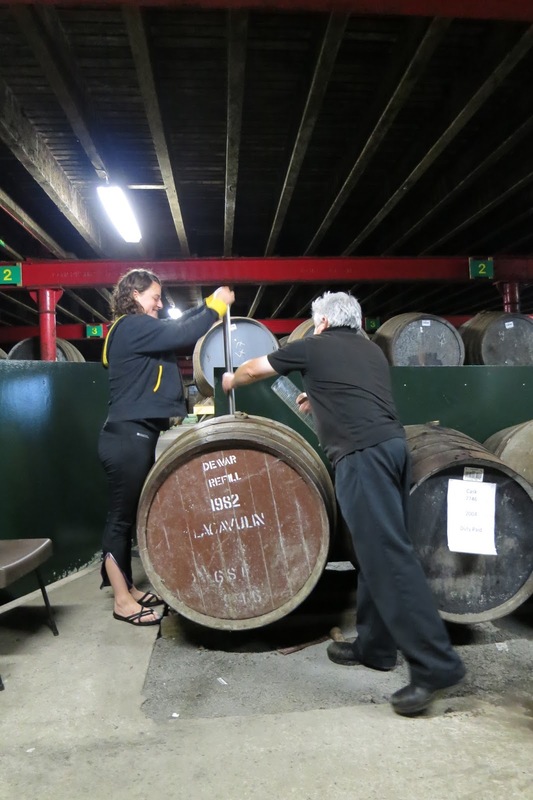 I've talked about Laphroaig Quarter Cask before, largely in terms of its place in the growing world of NAS whiskies and later after I had toured the distillery. 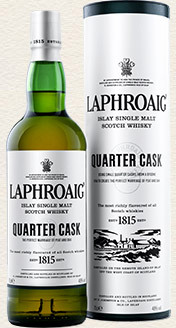 Quarter Cask was the first NAS whisky in Laphroaig's (growing) line-up. The spirit is aged for a number of years (6-8 seems like a decent guess), then transferred to 13 gallon 'quarter casks' as a finish. The rate of extraction from the wood is highly dependent on the surface area:volume ratio, so 'woody' flavors are extracted more quickly from these smaller casks. The whisky is then proofed down to 48%, which is a fair bit higher than the standard 10 Year, and non-chill filtered, which is also not the case with the standard 10 Year. This is an approach that requires more attention from the master blender, as the rates of maturation in the quarter casks will be more variable than with standard ex-bourbon barrels. There are partisans on both sides, some who prefer the slightly more mellow 10 Year while others are head-over-heels for the intensity of the Quarter Cask. I've been curious to see how they would match up. Nose: very woody, classic Laphroaig peat, wood/malt sugars, fresh timber, vegetal/herbal, malty, creamy vanilla, bourbon barrel berries. After adding a few drops of water, it becomes a bit more subdued, the malt moves forward, and the wood and smoke integrate. Taste: billowing dry woodsmoke, rather sour up front, some malty sweetness at the back, black pepper, subtle hints of fruitiness, some anise. After dilution, it becomes sweeter and less our throughout, a lot the malt becomes more prominent, wood and smoke come in later, and there are hints of orange peel. While I can see the appeal of this whisky, it's not quite my cup of tea. Though not immature, it doesn't have a lot of nuance - the flavors are relatively simple and in your face. The lack of an age statement lets Laphroaig put younger whisky into the bottle, which preserves the intensity of the peat smoke from the original spirit. The quarter casks are also very evident because this one is a short hop away from containing a lumber yard. The higher bottling proof compared to the 10 Year also helps to give this expression more heft, though I didn't feel like there was too much alcoholic heat. This is one to grab if you've already tried Laphroaig and thought "I like this, but I want even more smoke." If you're not acquainted with Laphroaig, I wouldn't start here. It's definitely a beast. After touring the Isle of Arran Distillery, I decided to sit down in their cafe to try a few of their whiskies that I hadn't had the chance to sample before. These pours are a bit smaller than I'm used to, at 30 instead of 50 milliliters, but it was still enough to get a good sense of what was going on in them. They were tasted in the order presented, which I hoped would present the least interference between each. Nose: strong malt complimented by citrus, just a hint of new make character, peanuts?, digestive biscuits, oats, cinnamon. After adding a few drops of water, it became even more malt-focused but with less of an edge, porridge, a little salty. Taste: sweet malt up front, a hint of new make, fruity/floral/citrus in the middle, fading out with very light oak tannins and something like sherry fruitiness. After dilution, it became sweeter throughout, fruit/floral notes give way to a hefty dose of pepper, the pepper hooks up with the oak at the back, very creamy with citrus in the background throughout. Especially in comparison to Bruichladdich's Bere Barley whisky, I really enjoyed this one. While both are bottled at 46% without chill filtration, the Laddie only had six years in comparison to the Arran's Bere eight years in oak, which was just enough to polish off most of the new make character without obscuring the unique character of the bere barley. Fundamentally, this is a drinkable and enjoyable whisky instead of a novelty. I hope Arran can do this again because I'd like to drink more of it. Nose: sherry with a vinegar edge, creamy vanilla malt underneath, floral, alcohol is fairly noticeable, oak undertones, shifts back and forth between malt and sherry with time. After adding a few drops of water, the sherry became much richer with a hint of burnt sugar, and there was caramelized malt, jammy, a bit of heather honey, and almost earthy. Taste: ethereal fruit notes with an ester edge (especially isoamyl acetate - fake banana flavor), sweet malt foundation, thin oak tannins with sherry at the back, with pepper building alongside. After dilution, it became much more coherent - everything comes together with bourbon, sherry, and heather honey sweetness throughout, a smoother transition to pepper and oak, and a less ethereal quality. This is the oldest standard bottling that Arran has released so far, dipping into stocks distilled only a few years after it was founded. While there were things to like about this whisky, it didn't quite come together for me, especially in comparison to their 14 Year, which is at least as good, more coherent, and significantly cheaper. It will be interesting to see if they maintain this expression or shift to a more standard 18 Year in future. Nose: noticeable sherry influence in a drier mode, unsweetened chocolate, floral malt, and coffee beans, growing maltier with time. After adding a few drops of water, it becomes lighter and more floral, shifting towards bourbon barrel notes of caramel and vanilla, while the sherry recedes and rides underneath, more oak comes out, alongside jammy fruit and a ton of malt. Taste: lots of cask strength character - rich with a rolling burn throughout, sweet sherry and malt up front, incredibly creamy, oak comes in at the back but interrupted by another wave of sherry, hints of tropical fruits in the middle. After dilution, the flavor doesn't lose any intensity but the burn fades a bit, amazing honied malt sweetness, becoming nutty further back, oak tannins stay very mild, sherry hits even harder with the oak at the back, slightly peppery. This was easily my favorite of the bunch. A rather new release, it is, like the 10 Year, from 100% ex-sherry casks. This compares favorably to the fantastic Arran Sherry Single Cask I reviewed a couple of years ago and portends well for future releases. At the time I described it as 'an enjoyable savaging'. The flavors are simply massive and I appreciated how well they held up under dilution. I've since purchased a full bottle and look forward to digging into it. I would highly recommend this to anyone who enjoys sherry bomb whiskies like Macallan Cask Strength or Aberlour A'Bunadh. It's a few bucks more in most places, but well worth the money for having an actual age statement and an accompanying increase in refinement. Nose: a very rubbery sort of peat, sweet malt, green bananas, a little new make character, salty/maritime, olive oil, plastic, rotting tropical vegetation, creamy, mild oak, a touch of fruit. After adding a few drops of water, there is less peat but more plastic, a remaining hint of fruit underneath, maltiness with a hint of wood smoke, and even more green character. Taste: sucrose sweetness throughout, slowly fades into rubbery peat, char, and oak. After dilution, it becomes less sweet and more green/herbal, the peat is slightly diminished, and it becomes fruitier and salty. I like almost everything I've tried from Arran, but this just doesn't work for me. The character of the peat just rubs me the wrong way. I'm not sure if it's where they're sourcing their peated malt from, some interaction with their yeast, or their stills/distillation process. There are some very discordant notes that time has yet to wear away. It might get better if there was some sherry cask influence in there to massage the rubberiness of the peat, but as is I can't get behind this one. While I did a vertical tasting of Glenlivet's core range a little while ago, I wanted to review this one on its own terms, since the cask strength bottling puts it in a different category. 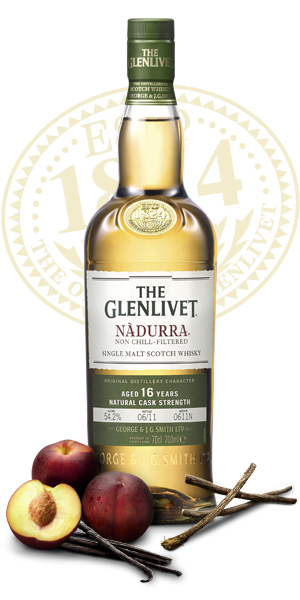 Nadurra is produced in batches of ex-bourbon cask whisky that aren't diluted with water before bottling. I had fairly high hopes, as I generally prefer cask strength whiskies, but the disappointment of Glenlivet's other whiskies tempered those hopes. Many thanks to Florin for a sample of this whisky. Nose: malty, a touch of vanilla frosting, caramel, grass, mild oak/fresh wood, toasty, noticeable alcohol, apples/pears/berries, soap or bubblegum, corn. After adding a few drops of water, it becomes greener and grainier, the fruit slips underneath, there's more vanilla, the oak becomes more integrated, and some citrus and floral notes pop out. Taste: rather hot - alcohol seems rather rubbery, very sweet and malty throughout, apples up front, mildly bitter oak, lightly peppery. After dilution, it becomes thicker and a bit less hot, more grainy, malt and oak integrate, vanilla peeks out from the cracks, there are citrus notes mid-palate, and some chocolate comes out at the back. I was honestly pretty disappointed by this whisky. I had previously tried a dram at the Highland Stillhouse and had a similarly dim impression, but wanted to give it another chance. Despite a minimum of 16 years in casks, it tastes rather young and hot, without a lot of depth or development. 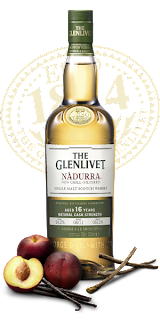 All the classic elements of Glenlivet - sweet malt, apples, grass, and vanilla - are present and it is more interesting than their core range, but it felt betrayed by lousy casks. While Glenlivet claims that all of the spirit was matured in first-fill casks, it tastes more like tired third- or fourth-fill casks. There is just isn't a lot of impact on the spirit despite resting in oak for the better part of two decades. It's begging for heftier doses of caramel and vanilla to lend the spirit some weight. As is, it's not a terrible pick if you need a starter cask strength whisky - the relatively simple flavors will be easier to pick out compared to something with more complexity - but it's not going to find a place in my liquor cabinet. Caol Ila is Diageo's workhorse distillery for making peated whisky. While not as highly regarded as their other distilleries on Islay, Lagavulin or the dearly-departed Port Ellen, there are those who think it's just as good with the right amount of age. Previously I had only tried their basic 12 Year, which was tasty but not a stand-out. This, however, was another matter entirely. I was lucky enough to attend the PDXWhisky tasting last April where this was served and take a sample home for more thorough evaluation later. It's not every day that you get to taste something that was distilled only a few months before you were born. Nose: gentle earthy peat, wood ash, toasted oak, dirty lemon, caramel, apples/pears, berries/wine, creamy, herbal, a touch of bacon. After adding a few drops of water, the peat and oak merge, more malt and lemon come out, the caramel becomes very creamy. Taste: sweetness, pepper, berries, and citric tang hit with piercing intensity immediately and stay throughout, followed by vinegar, polished oak and robust peat, which are joined by sweet malt, salt, and caramel going into the finish. After dilution, the palate becomes even more lemony and malty, some vanilla and cacao come out, with oak, pepper, and peat taking a bit of a back seat, while the peat becomes more industrial. Finish: citric, light peat and malt, caramel, polished oak, salt, berry residue, a touch of bacon. This whisky was, to put it mildly, a stunner. While I can't nail down any info, I have a feeling it was aged in either a first- or second-fill bourbon barrel. The caramel notes are almost off the charts, though there is less vanilla than you might expect. Most importantly, everything felt perfectly in balance, despite the intensity of the flavors. Secondly, even though this was bottled at a fairly hefty 53.8%, the alcohol barely makes itself known. Smoothness has never been a trait I've been particularly interested in when it comes to whisk(e)y, but this one has it in spades. Really, the only downside to this whisky is that it's more or less all gone. While older Caol Ilas are more abundant than some other distilleries due to their volume, it's still not the easiest thing to find (especially at a reasonable price). I could happily drink this whisky for a long, long time, especially when the weather is cool. But that also makes me very thankful to have been able to try as much as I did. One belief that has been gaining ground in the whisk(e)y world over the last five years or so is that higher proofs, especially cask strength or barrel proof, make for better spirits. There are all sorts of reasons given for this - there is more flavor, it's more 'pure', you get more bang for your buck (or put more punchily, "why pay for water?"). But as with many other attempts to create rules for deciding quality, I think it's less reliable than many might wish it to be. I think the way that this argument falls flat most quickly is on price (I will be pulling from my local market for comparisons as much as possible - the ratios may be different where you live). Generally, cask strength whiskies will be roughly 40% more concentrated then their watered-down brethren. So a commensurate increase in price is not out of line. However, it doesn't take much poking around to find examples where cask strength whiskies are going for significantly more than is warranted by this simple formula. Take a recent example, Angel's Envy Cask Strength. As noted by Tim Read, it goes for roughly double the price of the less potent version, despite having only 37% more alcohol and, according to Tim, tastes worse. Bowmore's 10 year old Dorus Mor, is roughly the same, going for at least twice what the weaker 12 Year runs, despite only having 38% more alcohol. There are exceptions to this trend, such as Old Grand Dad (32% more alcohol for a 27% increase in price) or Laphroaig (34% more alcohol for a 32% increase in price), but they are becoming the exception rather than the rule. Adding another layer to this, higher proof whiskies also often drop the age statement found on their less potent stablemates. This has become quiet common, especially for sherry-centric whiskies from the likes of Aberlour, Macallan, Glenfarclas, Glendronach, Glengoyne, etc. In these cases it's fairly safe to assume that you're getting younger, and thus theoretically cheaper, whisky in the bottle, which should balance out what one gains in terms of proof. It's more difficult to quantify the appropriate price differential that should exist between these bottles, but it certainly shouldn't be broader than between two age dated bottles that differ only in proof - for instance, Glenfarclas 10 Year and the cask strength 105 edition that is roughly double the price. Another common argument is that you can always add water to a cask strength whisky to bring it down to whatever level you happen to enjoy. To begin with, adding water right before you drink a whisky will be very different than adding it and letting the diluted whisky sit for a good chunk of time before drinking it. More than a few drops and the whisky can end up tasting excessively watery, instead of properly integrated. Which means that you're going to have to think ahead and decide how dilute you want your whisky to be. All of a sudden it's become a much more complicated proposition. Additionally, the casks going into a cask strength whisky are likely to be different than those going into a bottle that has been proofed down. 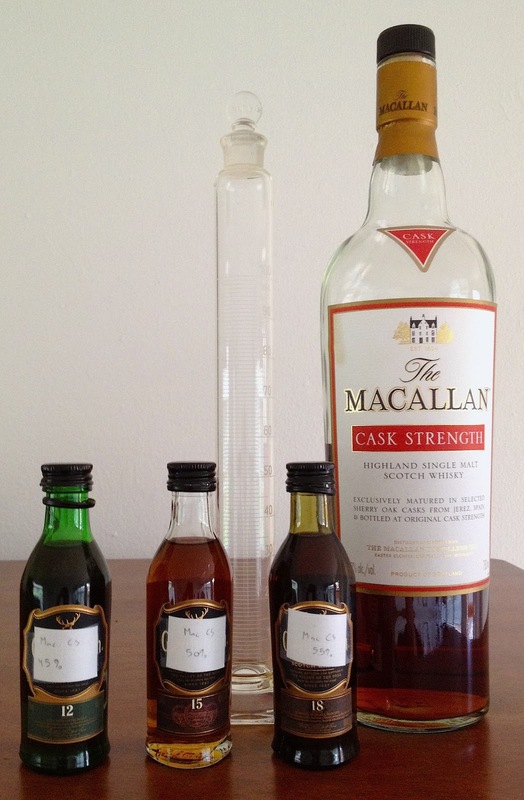 Some whiskies shine at cask strength but fall apart with even moderate dilution. The Thomas Handy rye I reviewed a while ago was actually worse proofed down to 45% than the standard Sazerac 6 Year which is bottled at that strength. Theoretically they're coming from the same stocks, but the Handy rye was genuinely bad at much less than barrel proof. To cite a more complex example, Macallan Cask Strength works great straight out of the bottle, rather well at 45% and 50%, and poorly at 55%. This suggests that the master blenders at distilleries choose some casks for their standard, lower proof expressions and other casks for their higher proof expressions. But one won't necessarily work as well for the other. Which is all to say that it's very difficult to know how well a cask strength whisky will handle being watered down. None of this is to say that I think cask strength whisky is a bad idea. I've enjoyed quite a number of them and will continue to do so. But I think the uncritical valorization of cask strength whiskies is somewhat misplaced, especially if it leads distillers to overcharge for them, safe in the knowledge that the market will still eat them up. Diluting whisky isn't always about stretching supply - sometimes it will genuinely taste better with some water. So to answer the question posed in the title of this post, I don't think it's either wholly bad or wholly good - cask strength is simply another factor to be considered when choosing whisky, neither more or less important than any other.